Arsenal manager Arsene Wenger has denied a Football Association charge of improper conduct and requested a personal hearing. The charge relates to the game against Portsmouth on 16 December when he was sent to the stands for the second half for criticising referee Steve Bennett. Wenger was angry at the award of the free-kick which saw Pompey take the lead in first-half stoppage time. "I will not accept any charge," said Wenger last month. "It's scandalous." 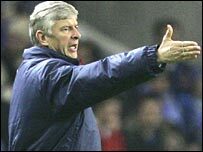 After complaining to the fourth official, Wenger continued his argument with Bennett down the tunnel. Wenger added at the time: "I think I am big enough to say when I am wrong and big enough to accept it, but on this particular incident I don't accept what has happened. "I arrived (in England) 10 years ago and believe me I have seen 10 times worse than what happened. "I complained because I didn't feel it was a free-kick but I didn't use any bad language. "It didn't disturb me too much and I don't expect to be banned. Do you want me sent to jail?" Wenger was fined £10,000 in December for his dust-up with ex-West Ham boss Alan Pardew.